I'm new to Jira and cannot find any help, Google or otherwise, on simply making a Dashboard component which lists all Users and their most recent Work Log entry. Any thoughts? 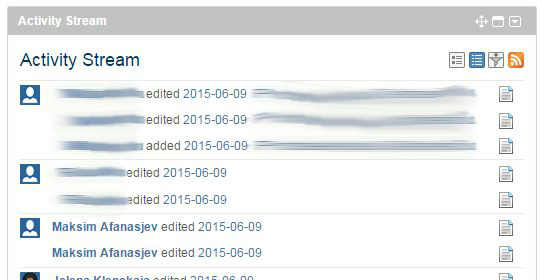 I would take a look at the Jira tempo plugin, it will solve all your time tracking and recording issues. We also combined it with the worklog assistant, since not everyone likes to book hours, this will simplify it a lot. I would expect you can also add these list and views to your Jira Dashboards, although I never tried. You can add this gadget to your Dashboard and select all the projects that you want to track. I find this gadget very convenient to track all Jira and Confluence activities as a stream in the dashboard. However, please note that I am using it for Scrum. You will have to try this for Kanban to see whether it meets your needs. To get that, Add Gadget to your Jira Dashboard and then use toolbar (seen on my screenshot) within the "Activity Stream" to switch to table view. Not the answer you're looking for? Browse other questions tagged kanban jira work-in-progress or ask your own question.